In studying the animal bones from Arroyo Hondo Pueblo, Lang and Harris had an advantage unknown to most faunal analysts: a collection so large and a site so well dated that the bones could be divided chronologically into ordered samples. By comparing these samples, they could identify short-term changes in the natural environment and in human economic practices throughout Arroyo Hondo’s history. 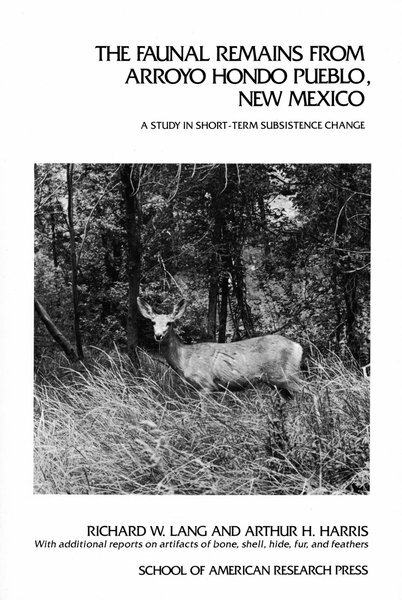 This fifth volume presents the results of faunal analysis from the Arroyo Hondo excavations, covering the topics of prehistoric vegetation and climate; the importance of various animals in the diet; seasonal hunting patterns; methods of butchering, skinning, and cooking; the prehistoric hunting territory; the raising of domesticated dogs and turkeys; and trade in animals and animal products. An appendix gives the raw data for each chronological sample. Three additional reports are included in this volume. First Marshall A. Beach and Christopher S. Causey describe the bone artifacts found at Arroyo Hondo, discuss their distribution, and compare them with artifacts from nearby sites. Second, the shell artifacts are described by Tamsin Venn, who also examines shell trade routes in the Southwest. Finally, Richard W. Lang discusses the artifacts of hide, fur, and feathers that accompanied human burials at Arroyo Hondo Pueblo.